A fine quality Antique Small Victorian Mahogany Pedestal Desk by James Shoolbred of Tottenham Court Road London. 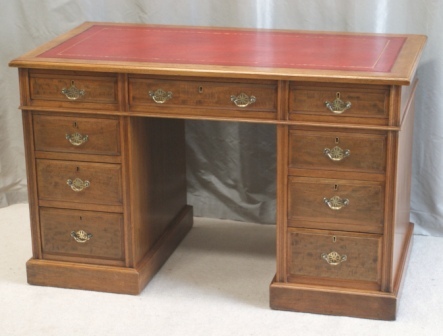 Dating from the late Victorian period this impressive desk has excellent colour and proportions. It has a very good quality replacement antique red and gilded leather writing surface inset into the moulded top and stands on substantial pedestals with graduated drawers. This small pedestal desk has the classic nine drawer front elevation and panelled sides and rear. With original brass handles and working locks with key this desk is in the usual pedestal desk configuration of three pieces i.e. two pedestals and the top for ease of transportation and has also retained its original concealed brass castors and wheels. This desk bears the Shoolbred stamp and their serial number 4302B. Original, solid, excellent quality and proportions. Ideally suited for home office or study. Width (overall) = 48" (122cm).